The arbor is our most popular ceremony site. It’s a ready made focal point, with a beautiful backdrop that allows for 300 guests. It’s simple, yet elegant design lends itself to transformations of all kinds. Here are a few ideas from past ceremonies that will surely get those creative juices flowing. A simple white drape across the smaller portion of the arbor will allow for the lush greenery surrounding you to really shine. There are numerous ways to drape this lovely arbor. Wrap the top and add hourglassing to the front columns, while creating a window-like look with the back columns. Along with the gorgeous floral and an antique chandelier, you’ll have the perfect amount of decor to dress up this simple and clean space. If you are the kind of couple that likes all things sparkly, then you MUST get a chandelier to create that perfect bit of elegance and shine that won’t overpower your love. Throw in some pretty strands of crystals dripping off the back, like the couple below, for extra glint and glimmer. 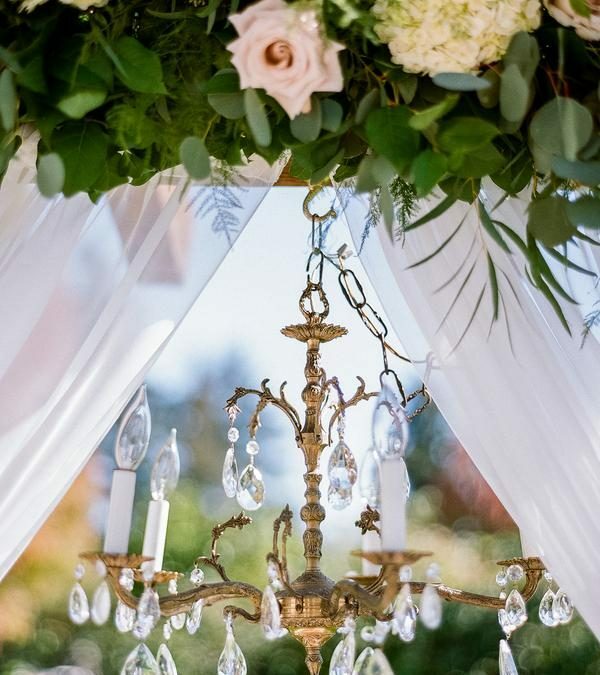 The next chandelier was paired with a truly romantic draping. The way it falls to the ground with no tie backs at all creates the light and airy feel of romantic perfection. or simply use them to line your aisle. Either way, flowers are the perfect accent to complete a gorgeous ceremony space. Pump up the glam with this simple side draping and dramatic back drop. Pop a chandelier overhead and feather filled vases on either side and you’ll be ready for a true Gatsby style wedding. Do not be afraid of color! The neutral setting loves a pop of color and really shows the couples personality. This starburst draping is perfect for the beautiful buttercup yellow drape and dainty chandelier. Whether you choose simple and sweet or gorgeous and glam, remember to make it your own. The guests will enjoy the shade offered by the covered portion of the large arbor, while you say “I do” to your best friend in the space created to showcase your style.